Born: c l004, Islip, Oxfordshire. Crowned: Winchester, 3 April 1043. Ruled: 8 June 1042-4 January 1066. 24 years. Married: 23 January 1045 at Winchester Cathedral, Edith (c I020-75) dau. of Earl Godwin of Wessex: no children. Died: Westminster, 4 January 1066, aged 61. After the welcome death of Harthacnute, there was no surviving mate heir of Canute’s line. His cousin, Swein, had believed himself heir, but his entitlement was overridden. In Scandinavia, Canute's domain was overrun by Magnus of Norway whilst England saw the return of the Saxon dynasty descended from Egbert in the form of Edward, the only surviving son Of Athelred (the Unready) and his second wife, Emma, the daughter of Duke Richard of Normandy. Edward was half Norman and had spent most of his youth (since the age of nine) in exile in Normandy. He thus grew up favouring Norman customs and, never having expected to become king, was also a rather idle and dissolute man. Upon his accession he realised he had a kingdom divided between Saxons, Danes and Norse with powerful earls of all factions. It is to Edward's credit that he succeeded in governing despite these differences. Critics of Edward accuse him of being a vacillating and indecisive king, like his father, but this may have been a facade for a cunning tactician, because Edward succeeded in ruling for over twenty-three years amidst much popular support. The fact that he was prepared to make strong decisions is evident from the start of his reign, when he confiscated his mother's property because she retained control over much of the Treasury. Emma was the most powerful and probably the richest woman in England, being the widow of two previous kings (Athelred and Canute), but her support for Edward had been limited. In fact she seemed to have almost disowned her marriage to Athelred and had become a strong supporter of the Danish court. Although Edward dispossessed her she was not sent into exile but remained in England. Charges were brought against her of involvement in the death of her sons by her first marriage and in supporting the Danish king Magnus. She seems to have bought her way out of this, although the more colourful records state that a trial by ordeal was arranged. Emma purportedly walked over nine red-hot ploughshares unscathed and at this show of innocence Edward restored all her lands and property and begged her forgiveness. She lived on at Winchester where she died on 6 March 1052, aged about sixty-six. The power base in England at this time was with Godwin, earl of Wessex, and his many sons. It was Godwin's position that secured Edward his kingship, as the English Danes had previously recognized Canute's nephew Swein as successor. Godwin had married first the daughter Of Swein (Canute's father) and after her death, Gytha, granddaughter of Swein's sister. Godwin regarded himself as a kingmaker (he had succeeded in raising Harold I to the throne and expected his son Harold II to become king in turn). To further cement this royal connection Godwin secured the marriage of Edward to Edith, the eldest child of Godwin and Gytha, in 1045. The marriage was apparently never consummated, and popular tradition has ascribed this to Edward's piety or effetism. Edward was to all intents married to the church. His single most lasting achievement was the construction of Westminster Abbey, which he financed personally and which was consecrated within a week of his death. Edward was not especially learned himself, but he loved to surround himself with knowledge and culture and encouraged scholarship throughout the country. With England benefitting from the first period of lasting peace for over seventy years, Edward's reign was the last glow of a Saxon golden age. Edward had no reason to like Godwin, for all that he knew he needed his support. Godwin had been implicated in the murder of Edward's brother Alfred, who had been imprisoned and blinded in 1036/7 at the order of Harold 1. Furthermore Godwin had twice changed sides, having come to power under Canute and supported Harthacanute before switching to Harold 1, only to back Edward after Harold's death instead of the obvious successor Swein Ulfsson. Finally, the two had politically opposed ideals. Edward was primarily a Norman. He filled his court with Normans and appointed them to the most senior posts, whilst Godwin believed these posts should be given to the Saxon and Danish nobility. It was a conflict over Edward's favouritism to the Normans that led to an argument between Edward and Godwin in 1051. Edward, now feeling secure, banished Godwin and his sons, and despatched Edith to a convent. It was not a popular move as the Godwins were held in high regard by the English. It may have been partly to ameliorate this that Edward abolished the Danegeld in 1051, the oppressive tax that Athelred had levied to pay the Danish pirates. During this power vacuum, William of Normandy visited Edward. William's father was Edward's cousin, and William knew that Edward had no formal heir and would not want the kingdom inherited by Godwin's sons. Although there is no record of any agreement at this time, it was later claimed that Edward then nominated William as his successor. However the following year Godwin and his sons invaded England. Edward was prepared to fight but the witan did not want a civil war. With bad grace, Edward pardoned Godwin and restored him and his sons to their earldoms. This made them more powerful than before. Godwin also secured his son Harold as senior amongst Edward's advisors, so much so that by 1053 Edward had more or less passed all administration over to Harold, leaving himself able to devote his energies to church matters and to hunting. Surprisingly during this period Edward supported the claim Of Malcolm III to the kingship of Scotland and gave his authority to an invasion of Scotland by Siward, earl of Northumbria, to depose Macbeth and place Malcolm on the throne. The initial onslaught was only partially successful but Malcolm eventually succeeded to the Scottish throne in 1058 and his friendship to the Saxons would prove valuable to Saxon exiles in future years. In the meantime Harold Godwinson grew from strength to strength. It was he who led most of the assaults against the Welsh who had harried the border territories for many years. During these campaigns Harold demonstrated his superior soldiery and skills as a general. Harold was increasingly looking like a successor to Edward, which Edward did not want. Even though he may have promised the succession to William, the anti-Norman feeling in England made this too dangerous a course to promote. Edward was thus relieved when he learned in 1054 that his nephew, known as Edward the Exile, was alive and well in Hungary. An embassy was despatched to recall him to England. As the son of Edmund Ironsides he was the natural successor. His return was delayed but Edward finally arrived in England in August 1057. Within a few weeks he was dead, probably killed by order of Harold, though there is no evidence. Edward's succession plans were thwarted, although he now raised Edward the Exile's four-year old son, Edgar, as his heir (atheling). Edward was forced to acknowledge that should he die before Edgar came of age, Harold would be regent. As a result the final years of Edward's reign were ones of increasing uncertainty. 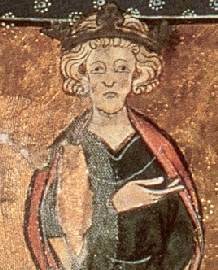 Edward still favoured William of Normandy as his successor, whilst the English increasingly favoured Harold; at least as war-leader if Edward died before the young atheling came of age. There was another claimant, Harald Haadraada of Norway, who already ruled Orkney and the Western Isles, and believed England was his by right. In 1065, Godwin's son Tostig was deprived of his earldom in Northumbria following his inept and tyrannical rule, and was banished to Flanders. He soon threw in his lot with Harald Haadraada, so that by the end of 1065, when it was clear that Edward was dying, the English throne was under considerable threat and needed strong leadership. Thus, when Edward died in that first week of January 1066, it was Harold who became the last king of the Saxons.